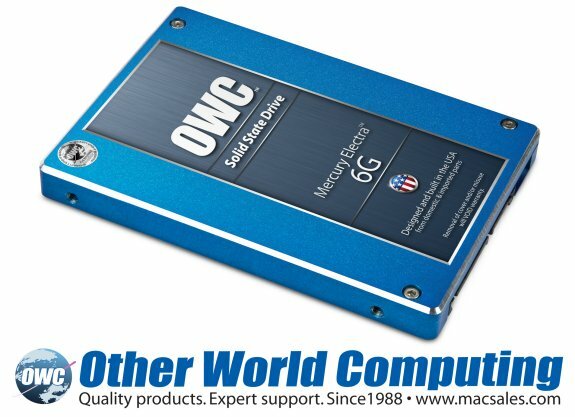 Other World Computing (OWC®) http://www.macsales.com, a leading zero emissions Mac® and PC technology company, today announced the $129.99 MSRP 60GB capacity model to its award-winning, built in the USA OWC Mercury Electra™ 6G Solid State Drive line. Offering a lower starting price point to one of the industry’s fastest 6G SSD lines, the new SandForce Driven™ 6Gb/s 60GB capacity OWC Mercury Electra 6G SSD utilizes the highest quality components available, including Tier 1/Grade A NAND, to deliver 556MB/s read and 523MB/s write sustained data rates for over 7X faster performance than a standard factory hard drive found in Mac and PC computers. “Our newest 60GB Mercury Electra 6G SSD is priced aggressively to offer one of lowest price points on the market for one of the highest performance SSD available,” said Larry O’Connor, Founder and CEO, Other World Computing. “Then factor in our best in class warranty coverage and support services reputation and it’s safe to say this new model represents the best value on the market for a 6G based SSD”. Whether a consumer has a Mac or PC with the SATA Revision 2.0 (3Gb/s) data bus or the latest SATA Revision 3.0 (6Gb/s) interface, the OWC Mercury 6G SSD line is able to deliver near bus saturating speed when installed in either interface. OWC benchmark testing confirms OWC Mercury 6G SSDs delivers sustained data rates over 275MB/s in the “3G’s” 300MB/s max speed bus. Taking advantage of “6G’s” interface’s maximum bandwidth of 600MB/s, Mercury 6G SSDs provide up to 559MB/s sustained reads and 527MB/s writes. Ordinary SSDs offer fast read/write performance during first initial uses, but can then experience significant write speed degradation over repeated, long-term usage. Independent simulation tests by leading drive performance experts confirm OWC Mercury SSDs’ ultra-efficient block management, wear leveling technologies, and real-time data redundancies enable incredibly high performance and extreme reliability, both of which are maintained over long-term intensive use. Thanks to SandForce® DuraClass™ technology, OWC Mercury 6G SSDs are able to provide up to 100X higher data protection than provided by ordinary SSDs as well as leading enterprise class hard disk drives. By combining the highest level of Error Correction Code (ECC) and SandForce RAISE™ (Redundant Array of Independent Silicon Elements) technology along with 7% over provisioning reserve/overhead flash allocation, OWC Mercury 6G SSDs provide RAID like data protection and reliability in a single drive application. To ensure the highest level of customer satisfaction and confidence, OWC is extending its 30-Day Money Back Guarantee to include the new Mercury Electra 6G 60GB model. If a consumer is not completely satisfied with any OWC Mercury 6G SSD for any reason, they simply need to contact OWC’s award-winning Customer Service department – which offers 24/7 Live Chat support - to request a full, hassle-free refund.